So, What Really Happened During Those 30 Days? 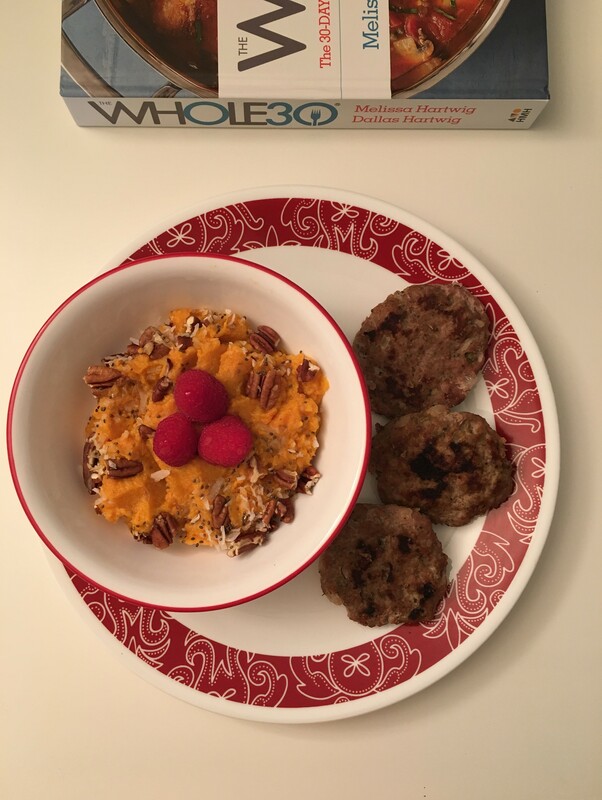 Whole 30 is a 30 day eating plan that cuts out sugar, grains, dairy and legumes to find out what our bodies may be responding negatively to. 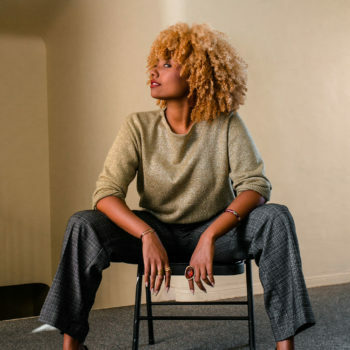 Prior to Whole 30, I have experienced a lot of stomach bloating, cramping and burning stomach, acne breakouts, sluggishness and worst of all, really painful and heavy menstrual cycles. Starting Whole 30 on April 1, 2018 and finishing April 30, 2018, I can say that I noticed a ton of changes and developed some good habits to carry forward while not on the eating plan. See below some things that I loved, learned and noticed while on Whole 30. Almost instantly, during the first week of Whole 30, I didn’t have any stomach issues. The bloating increasingly went down throughout the weeks and my stomach felt a lot flatter than normal. No burning, “send you straight to the bathroom” feels. WINNER! This success is probably from the removal of dairy on the eating plan. We all are a little bit lactose, whether we choose to acknowledge it or not. I’ve always been pretty good at incorporating veggies into most meals. However, because Whole 30 removes grains which includes rice, beans and bread, I found myself eating twice as much (if not more) veggies to fill me up. 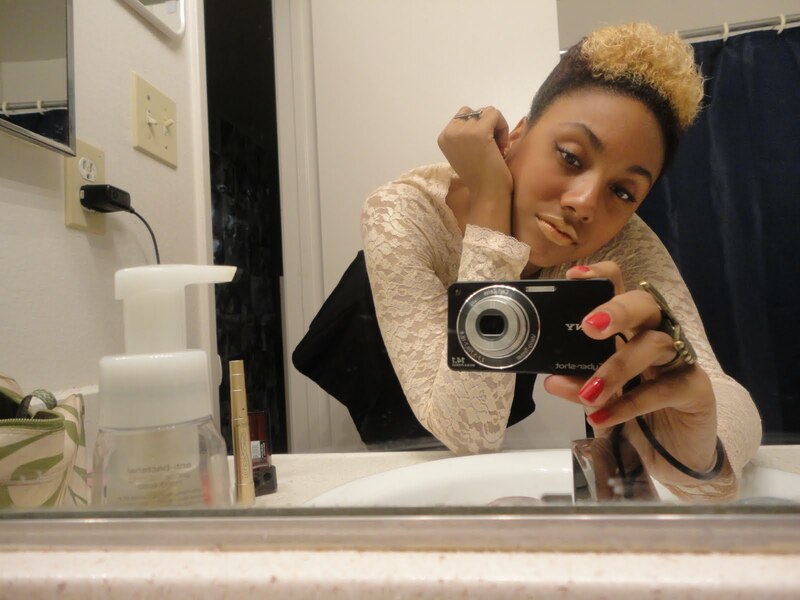 After 2 weeks, I noticed that my hair and nails were growing more rapidly than ever! Seriously though, if you want longer, stronger nails, eat, more, veggies. The second and third weeks of Whole 30 were when I really started to notice less acne breakouts. A lot of factors play apart in why so many of us have breakouts such as stress, dry skin, oily skin etc. And food, for so many of us is a trigger, but sometimes we just don’t know which foods are the culprit. Removing the added sugar, the processed food, the dairy and the grain proved to help with my breakouts during those 30 days. 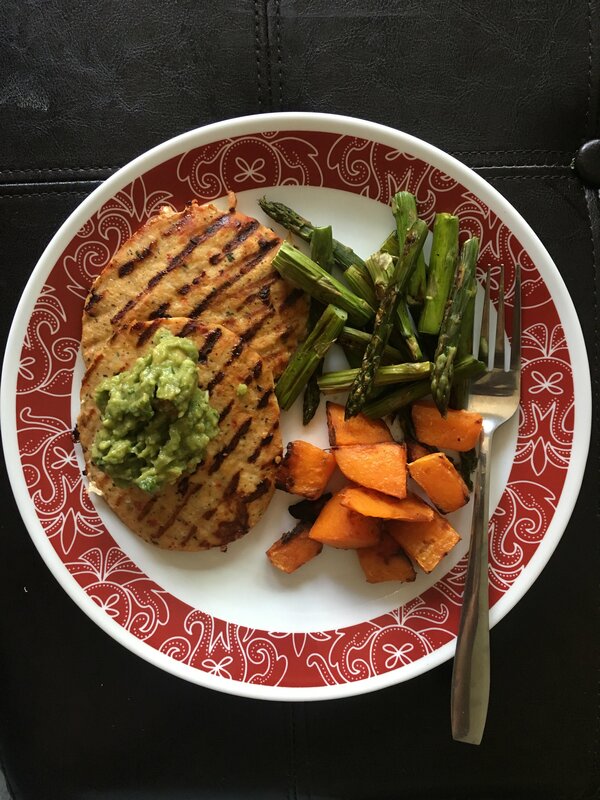 After the first few days of Whole 30, I started to notice that I didn’t need or want to eat all of my meals. Typically, I’m a go back for second helpings kind of person, but during those 30 days, that was rare. I rarely found myself “starving”as we like to say. And once my food was in front of me, ready to eat, I didn’t have the same desire to devour everything is minutes. I got full faster, with less food and just didn’t feel the need to eat until I pop. I only really wanted to eat until I wasn’t hungry anymore. I noticed I had more energy during workouts mostly. 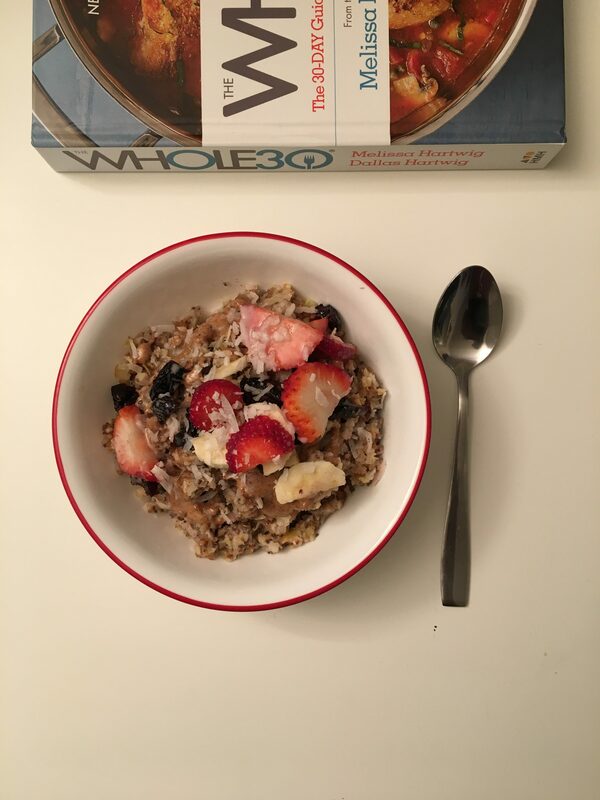 But in general, during Whole 30 I felt lighter and more energetic. Now don’t get me wrong here, I definitely missed my sweets, especially after dinner, I want dessert. However, as the month progressed, I less and less had cravings for salty and sweet snacks/treats outside of regular meals. 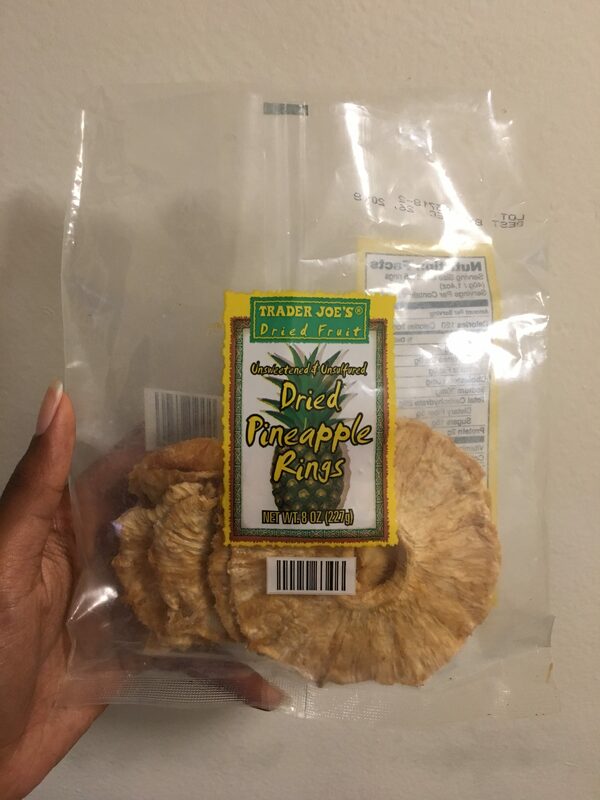 Speaking of dessert though, sometimes I would eat dried mango or dried pineapple from Trader Jos after dinner if I really felt the need for something sweet. 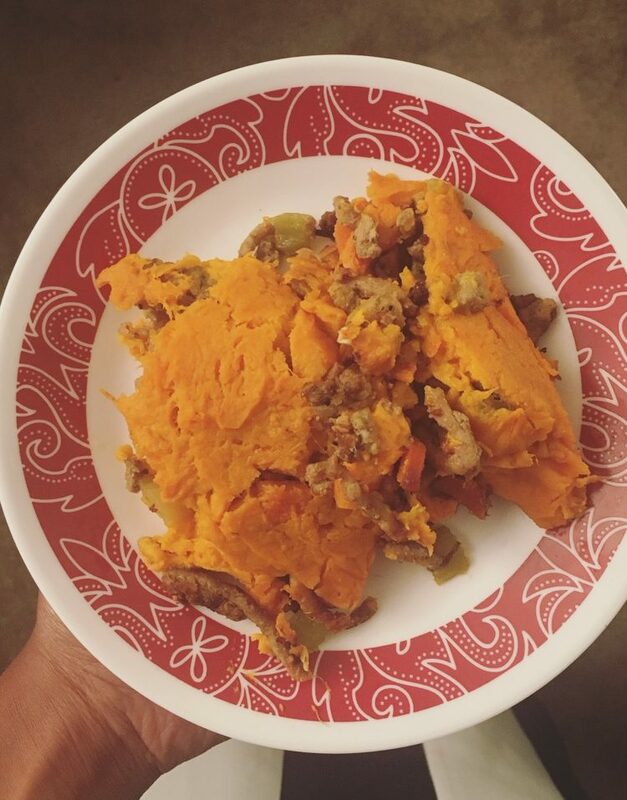 Because Whole 30 basically requires cooking at least once or more times per day, I had to constantly be thinking about food, what I was going to eat, and when I was going to cook it. Many times, when not on Whole 30, we decide what we want to eat when we start to feel hungry, no pre-planning or thought beforehand regarding food. Since food is so readily available for us, we don’t have to think much about food preparation if we don’t want to. In a sense, its nice because it frees up time for us to do other things in life other than hunt, gather and cook our food. We can just roll through the drive through or stop for take-out on the way home. But, because of that, we no longer know OR care much about the ingredients that go into our food, into our bodies. Hence, we develop allergies and health issues that seem hard to pin point. Many of our problems come down to the ingredients in our food. I think eating out is fun, convenient and something that brings people together these days. However, I think its important to KNOW and COOK more of what we are eating. 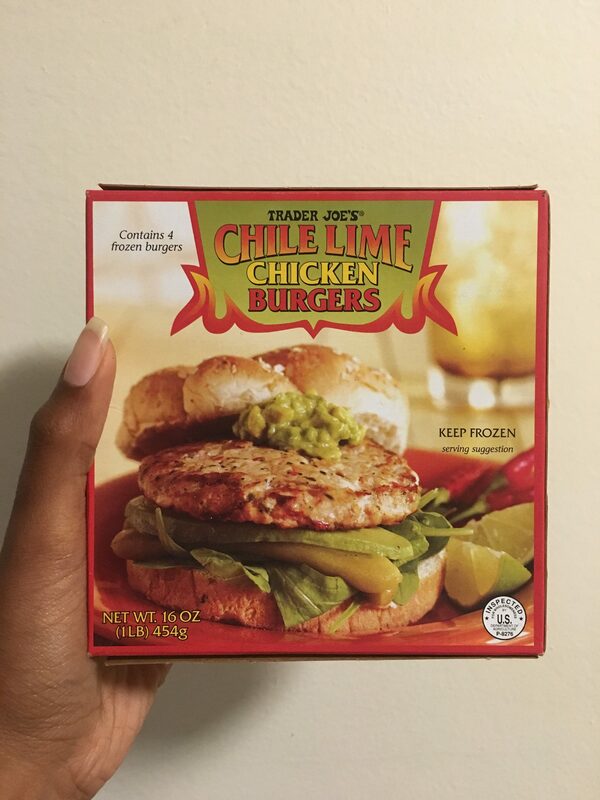 It definitely takes more effort to read the packaging labels of food, and spend 30 minutes to and hour in the kitchen on some nights preparing meals, but to me its worth it to really know what I am eating. Just being in the kitchen more often forced me to get more creative with flavors and ingredients. And because the Whole 30 ingredient list can feel very limiting, as the month progressed I felt more challenged to be creative with my meals, making them better and different from prior meals. 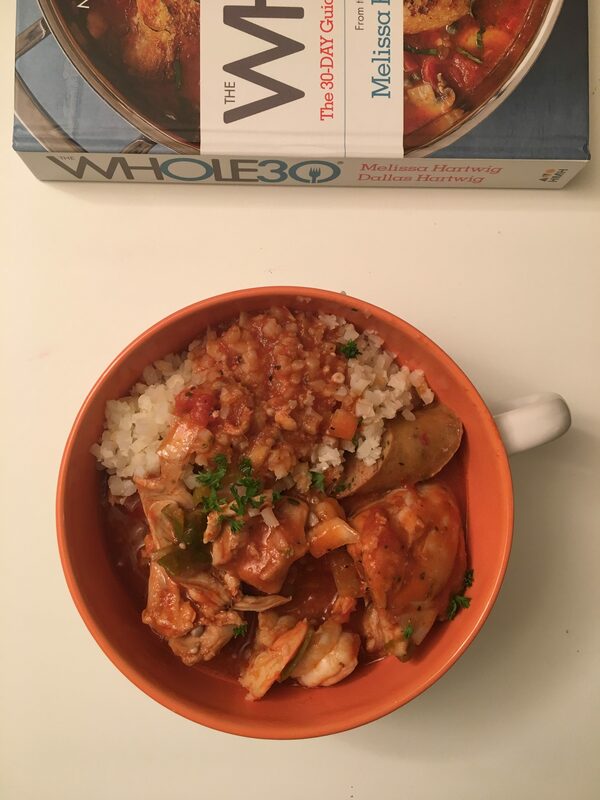 Here’s more of how creative it got on Whole 30, with a previous post. 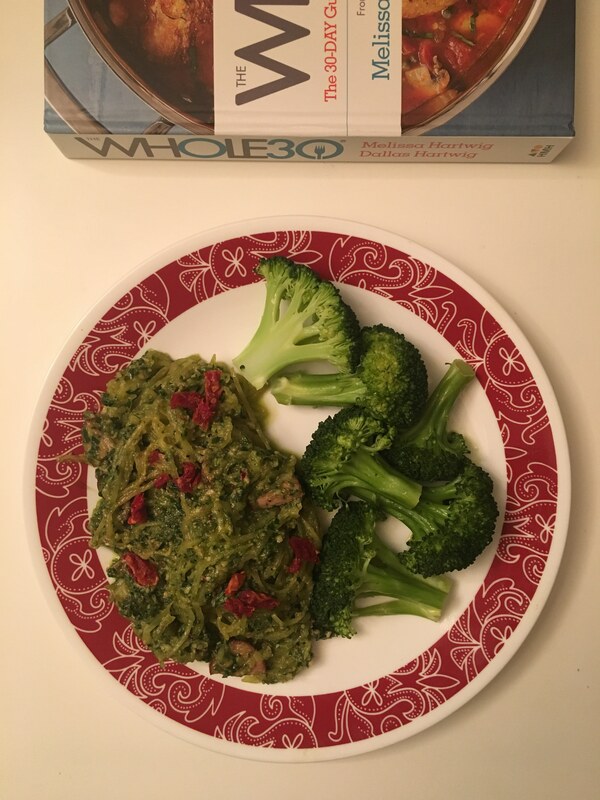 In addition to the many things that I learned while on the Whole 30 plan, I also got very acquainted with a few new foods that I now use, eat, and cook with regularly. I use cauliflower rice in place of rice or quinoa. You can either make if yourself in a food processor or buy it frozen. 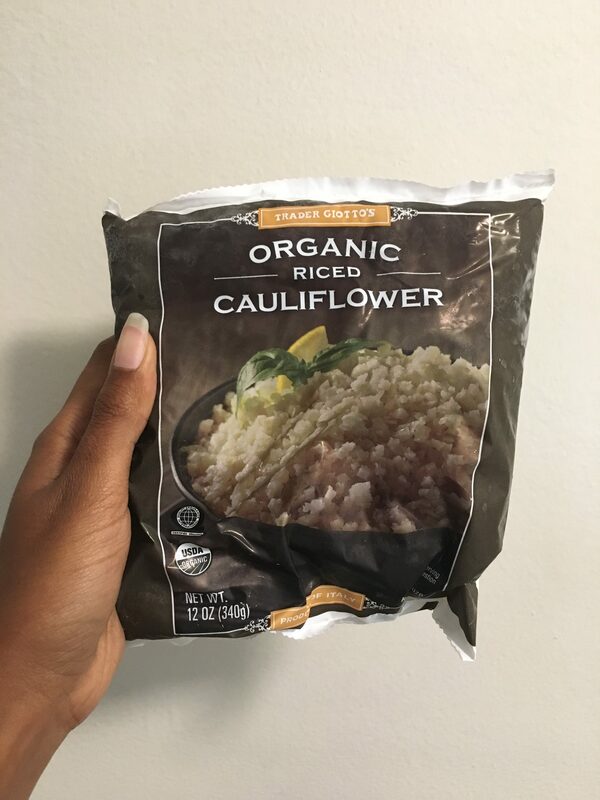 I like the frozen Trader Joe’s cauliflower rice. 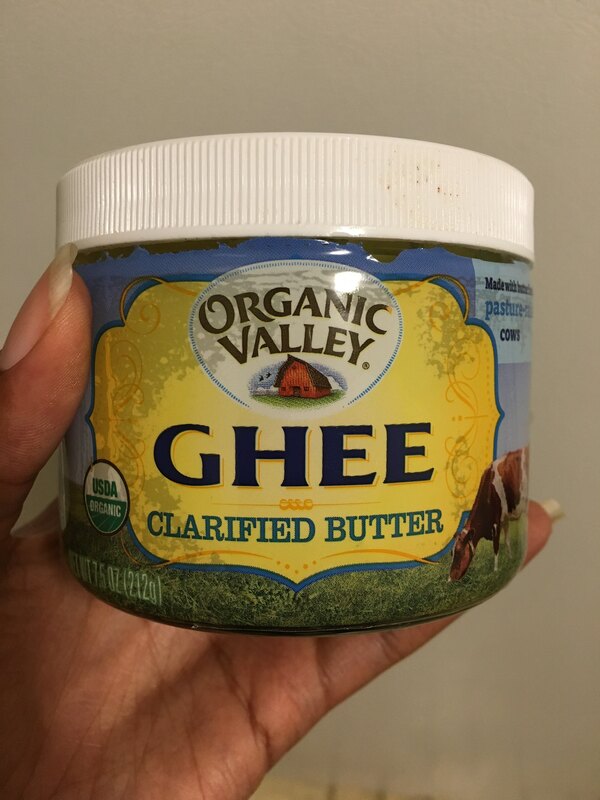 Ghee is basically butter without the milk, making it Whole 30 approved, obvi. It can be used like butter, or as oil – a cooking fat. It has good flavor and since it doesn’t have milk it, when NOT on Whole 30, I still enjoy using it on toast, oil in sauté pans, or on sweet potatoes. The one I use is from Whole Foods. 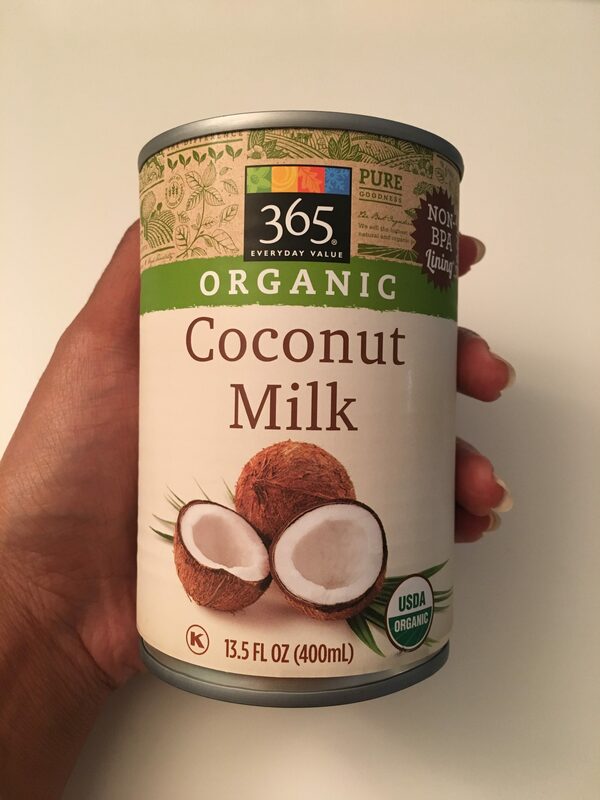 The Whole 30 experience was my first time using coconut milk, and I used it often. It was great to use in curry dishes, drizzle over grain-free oatmeal or mixing with smashed sweet potatoes for a creamy texture. I learned that not all canned coconut milk’s are the same, and that I prefer the full fat creamy one from Whole Foods. Sprouts also sells a good coconut milk. There are many different kinds out there, but make sure to read the labels to see if they are Whole 30 approved. My mom used to bake apples all the time when I was growing up as a dessert. 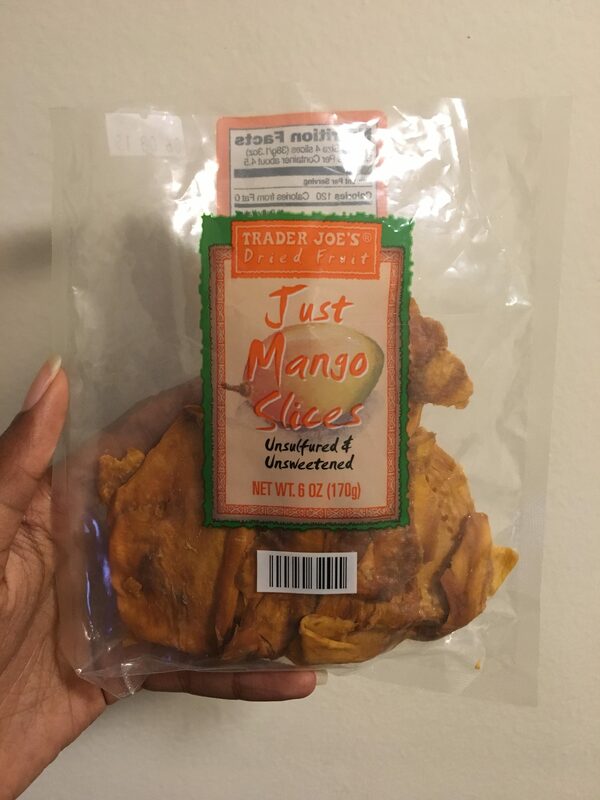 If you cut them in half, core them, put a little ghee and cinnamon on them, and place in the over for 45 mins to an hour, they make for a great breakfast side or snack. Yes, Whole 30 approved. 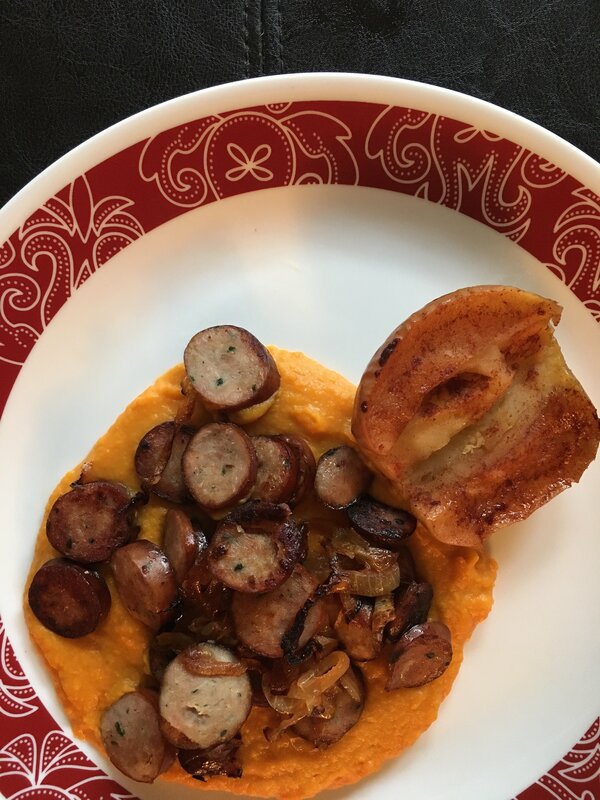 Aidelle’s Chicken Apple Sausage is another easy protein to build a breakfast lunch or dinner around. I would find these sausages at either Ralph’s or Walmart, but they do sell them in many other grocery stores. 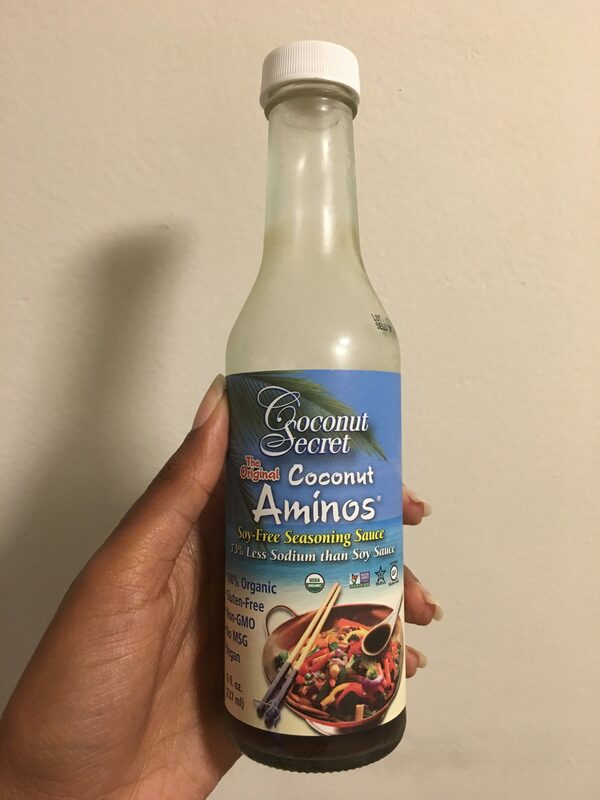 Coconut Aminos is simply a great substitute to soy sauce while on Whole 30. I like use the one from Whole Foods to make Whole 30 Approved lettuce wraps or homemade fried cauliflower rice. Obviously, vegetables make a good Whole 30 approved noodle substitute. Zoodles and spaghetti squash are fairly easy to make, but can take some time. 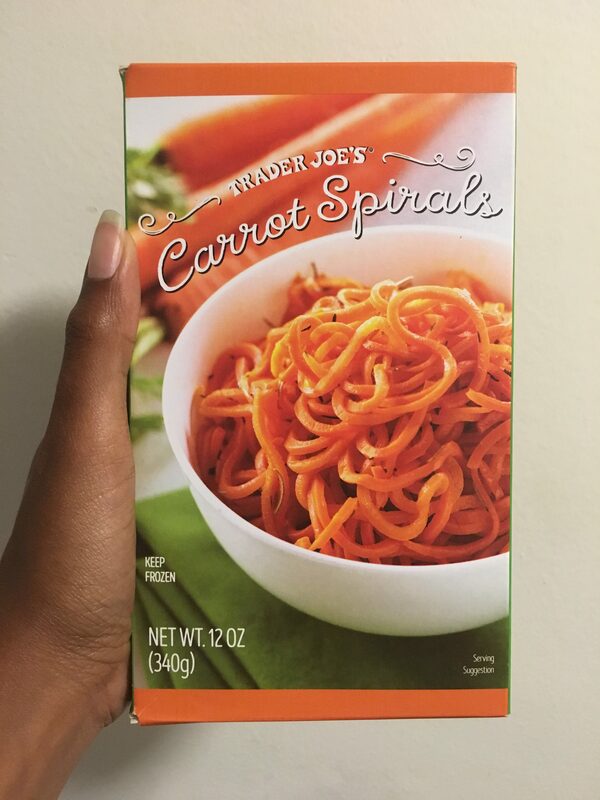 I find to really enjoy the Trader Joes frozen carrot noodles for some Whole 30 approved dinners. 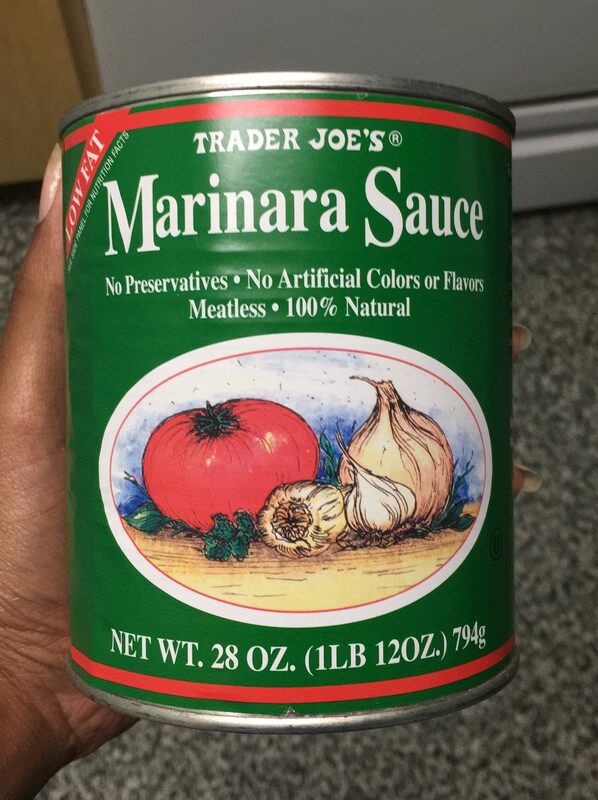 For a quick “spaghetti” with no pasta, I found this Trader Joe’s Marinara with no added sugar. Surprisingly it is a challenge to find red tomato based pasta or marinara sauces with NO added sugar. Until now, that is. 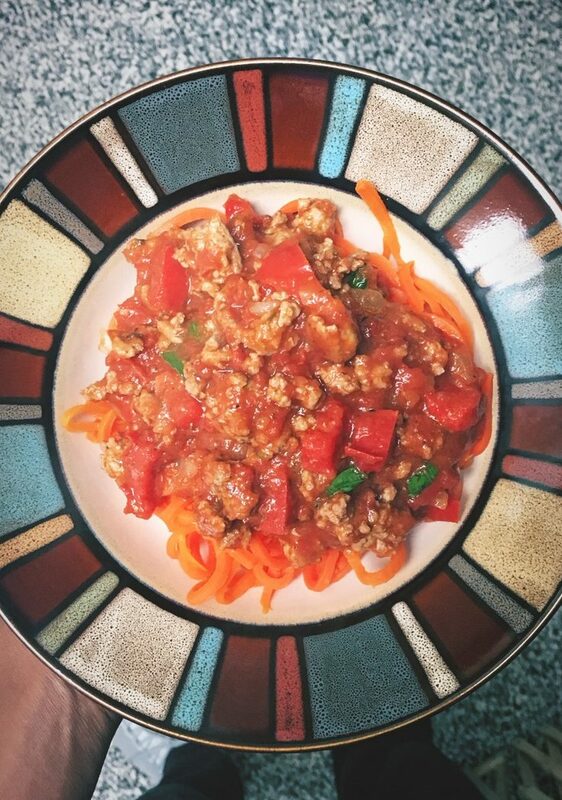 😉 I combine with carrot noodles all the time for a simple Whole 30 “pasta” dish. 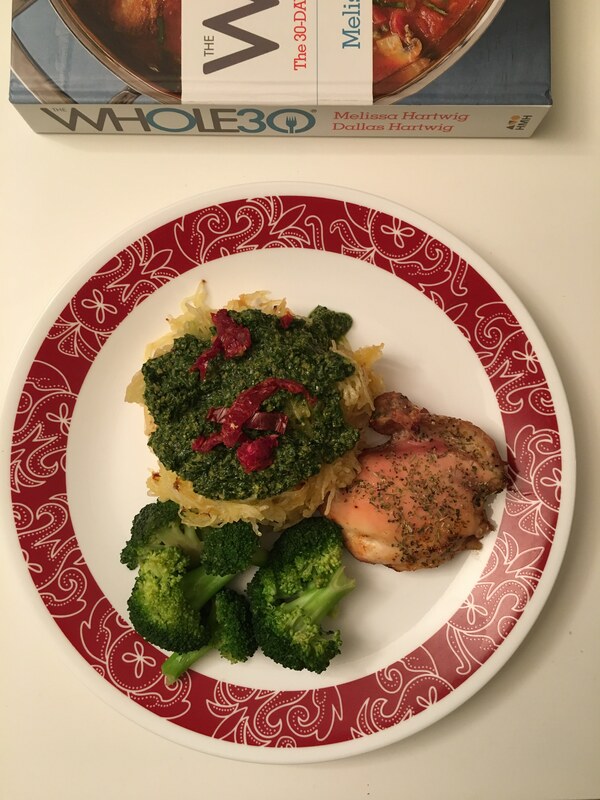 Many of the meals that I prepared were straight from the Whole 30 book. But a lot of them were actually from Pinterest and Google searches. So many people have gotten creative, making some of my now favorites. This was truly one of my favorites! 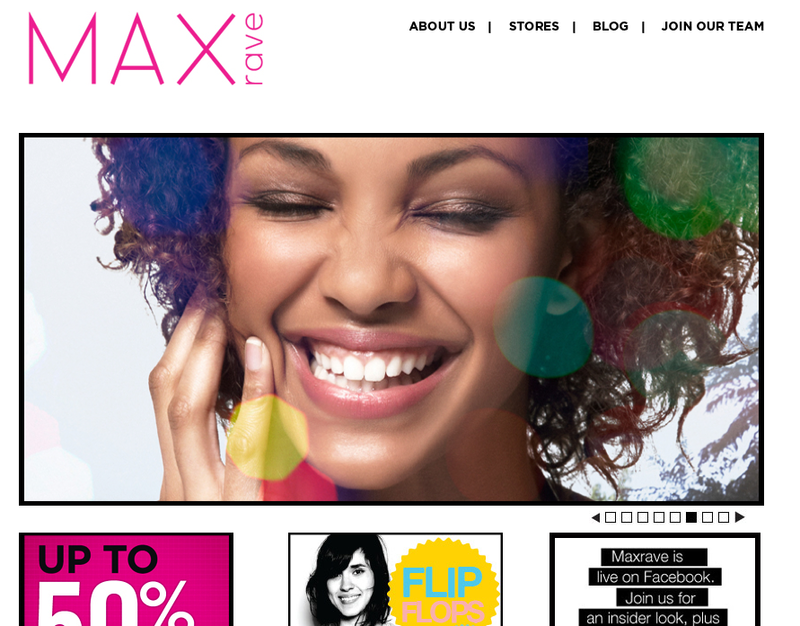 And it’s completely customizable. I have deviated far from the original recipe, however the foundation ingredients I use are still the same. And most importantly, I keep it Whole 30 approved. Whole 30 PF Changs Lettuce Wraps AMAZING! Especially if you are an egg person, which I am not, there are tons of ideas. However, anything with apples, sweet potatoes, avocado, or sausage was a win for me. 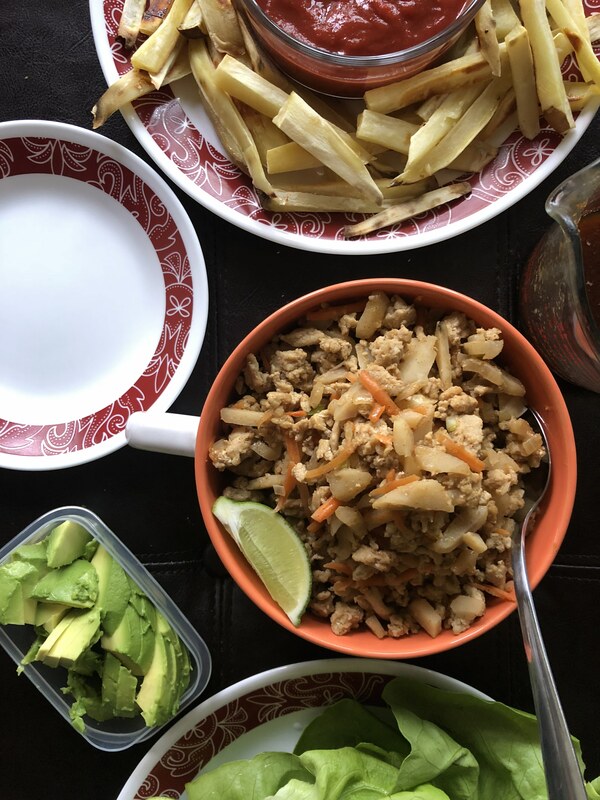 Now that you have read through my Whole 30 experience, my favorite foods and recipes, here are a few tips I found to make my life a little easier and enjoyable while on the meal plan. 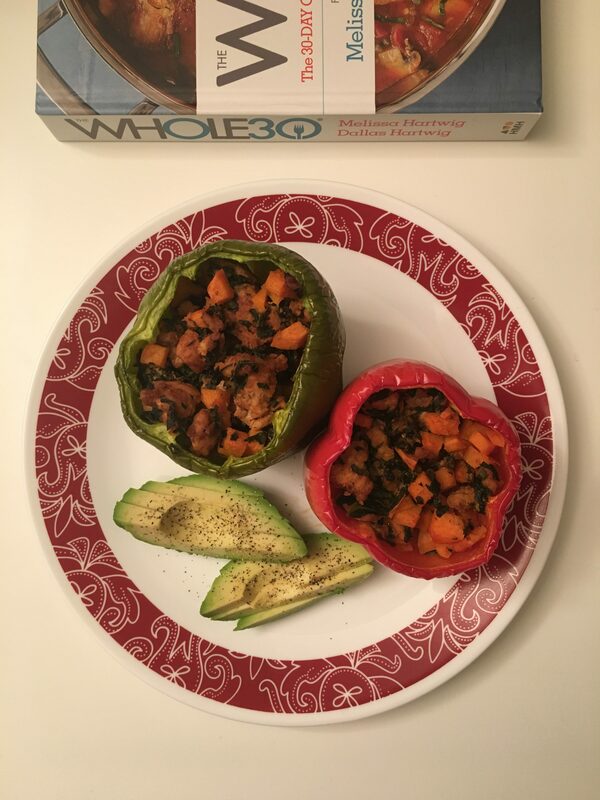 The Whole 30 book provides a meal chart that you can follow, using meals from the recipes included in the book. While I really liked the idea of having a meal chart, I didn’t care for how the meals were organized and didn’t know if I could, or would even want to stick to it. SO, I made my own! Using Excel, I created this food chart that I filled in weekly. 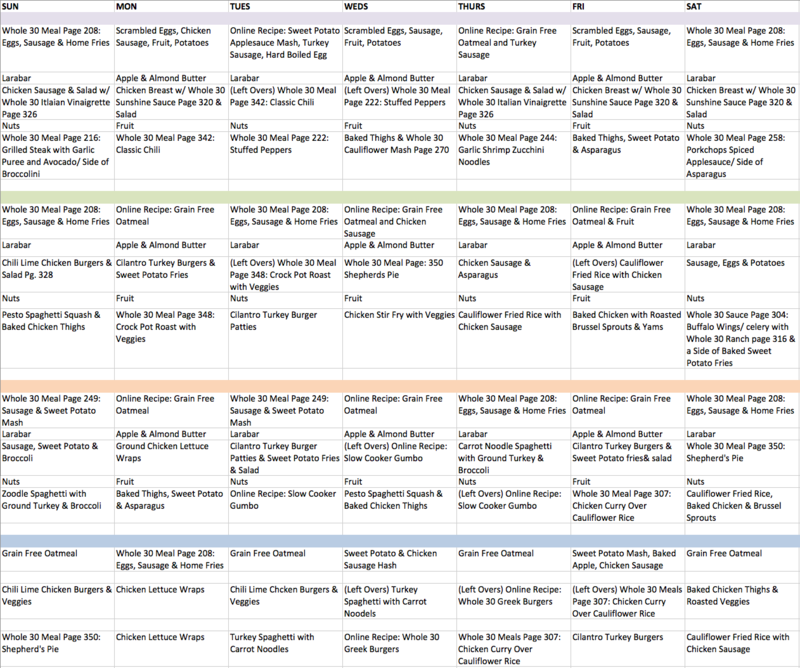 Everything was pre-planned to help alleviate some of the thinking that goes into meal prep, but I did switch some meals around depending on how “life” was going, if you will. Download the meal chart that I created, here. We’ve all been there. Run in the store, grab the basics with no check list and get out, as fast as possible, by any means necessary. On Whole 30, I don’t recommend doing that, at all. Especially if you are being cost efficient, and hate wasting food, as I do. After filling in my food chart with the meals I want to make for that week, I would then be able to make a grocery list inclusive of the exact items I need to make those meals. Nothing more and nothing less. And because I took the time to create these charts and lists it left me feeling confident and prepared when it was time to step into the kitchen, or open the refrigerator once the hunger kicks in. 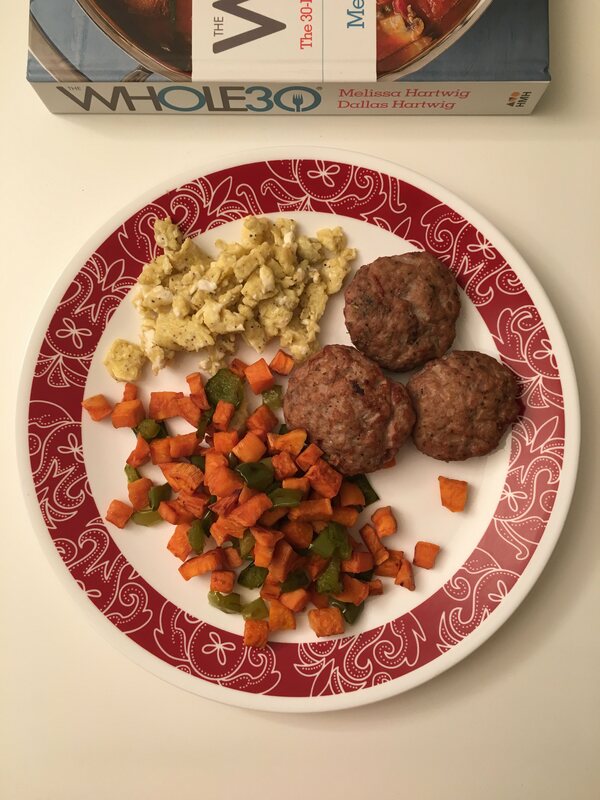 One thing that I noticed, which is completely normal on Whole 30, is that sometimes you may need or want to eat leftover dinner for breakfast or maybe an easy breakfast meal for dinner. When the days get rough, and you don’t want to think too hard about food, you just need to fuel your body, don’t feel weird about eating leftover spaghetti squash for breakfast, OR making that grain free oatmeal for a small, fast dinner. As long as it’s Whole 30 approved and tasty, who cares? If you do not already own a food processor, please buy one for Whole 30. I was going back and forth as to whether I should invest in one, and it was the best decision I ever made. I use my food processor to make all my favorite dishes, like the grain free oatmeal, the Whole 30 Pesto, and the creamy sweet potatoes. If price and storage space is your concern, I bought a really inexpensive small food processor on Amazon (which you can look at and purchase on the LCM List here.) I L OV E this little kitchen gadget so much, I even got my mom to purchase one. True story. Okay, if you can, I highly recommend doing the re-introduction the correct way (Full details on re-introduction in The Whole 30 book). I was not able to do the re-introduction of “regular” foods correctly because I immediately went out of town for a week, and it was basically impossible to manage any type of diet while traveling. However, knowing exactly what foods bother or effect your body negatively is the main reason a person would do Whole 30 challenge in the first place! Granted, since then, I have been able to learn what foods really should not be apart of my diet anymore, but I would have a more detailed and accurate read on the effects of many more ingredients and foods if I would have been able to properly re-introduce. So, read the details in the book and plan for it, if you can. Overall, my Whole 30 experience was great. I learned a lot about food, how it affects my body and what I can do to care for it. The Whole 30 is literally like pressing a reset button on your body. And I’m glad to know that at any point in time I can stop whatever nonsense I may be indulging in, and turn to the Whole 30 diet to feel better. Let’s be real here, I’m still going to eat dairy, and grains and sweets because I love them! But now I know what the consequences will be for my body, and also, most importantly how to fix it. I really hope this helps anyone who is interested in trying the Whole 30 challenge and lifestyle. And, I hope that someone tries some of the food recommended in the post!